Here’s Part 2 of my Spring Training adventure. On Sunday, we didn’t have any baseball planned, so we thought we’d explore the area. We got in the car and headed out to a place called Apache Junction. It’s a real pretty area. We saw the Superstition Mountains and headed towards the Lost Dutchman mine. Here’s Dad and I taking in the view. It was windy and cool, but it felt good on my face. It was a great road trip. I bet you can see lots of stars out there at night. On Monday, we made our way down to Tucson to catch the Rockies vs. Angels at Hi Corbett Field. It was hot. REALLY Hot! Dad and I got a spot on the rail to see if we could add some autographs to our collection. Here’s Franklin Morales warming up. We did pretty well. I got to meet Jason Hirsh, Clint Barmes, Ryan Spilborghs and Clint Hurdle. I saw Tulo sign for a few minutes, but he didn’t make it down to me. I also managed to get a baseball from an Angels player during batting practice. The guys got off to a rocky start (no pun intended)… But, it was great to see them in action again. Here’s Ryan Spilborghs leading things off. He was followed by Tulo. Jason Hirsh on the mound. We sat behind Mike Scioscia and his coaching staff. I already mentioned that it was hot. It was too hot for me. I spent alot of my day in the shade, with a big cup of ice water. Mom and I got a picnic table with a big umbrella to keep the sun off of us. Gran C took me to the team store to do a little shopping and cool off. She spoiled me with me a Rockies sippy cup, a new Rockies hat and a program. Dad and I also went off on a walk and spotted Garrett Atkins heading into the clubhouse. He was really nice to us and signed our World Series ball! That’s our 11th autograph on that ball. Before the game started, I got spotted by a photographer for the Tucson Citizen newspaper. She snapped pictures of me getting an autograph from Ryan Spilborghs and hanging out with Dad. She talked to Dad and I for a few minutes and said we might end up in the paper. When I got home and checked their website, I found a bunch of pics. Here’s a link to one of the articles. Also, if you go to the slideshow section and search for “Hot Day at Hi Corbett”, you’ll find the whole gallery. We’re in several shots, including one where Dad and Pappy are in the background with Tulowitzki at the plate. That’s my first time ever in a newspaper. When’s the last time you saw the e*trade kid in the newspaper? As if that wasn’t enough, we ran into D, from the Rockpile Rant! He was next to us before the game getting autographs. He and Dad talked for a while. D, sorry for being cranky. It was just too hot for me out there. Here’s a shot of us after the game hanging out in front of the MBU. That stands for Mobile Blogging Unit. He and his friend Andy travel in style. They spent over a week watching games, getting autographs and snagging baseballs in Spring Training. After the game, we drove back up to Phoenix, made a quick stop for one more In-N-Out Burger and caught our flight home. It was a great trip. Everyone had alot of fun and made some great memories. I hope you enjoyed reading all about it. It’s time for me to catch some zzz’s. Spring Training is finally here! I’m heading out to Arizona this weekend to catch a few games. We get into Phoenix on Saturday morning and will probably take in one of the many games going on around town. Sunday will give us a chance to do a little exploring and sightseeing. 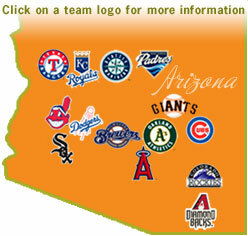 Then on Monday, we’re heading to Tucson to catch my Rockies at Hi Corbett Field. I can’t wait! The only question is who should I go see on Saturday? White Sox vs. Cubs – Sold out! Indians vs. A’s – Can I handle seeing Matt Holliday in green? What game do you think I should see? Also, I wanted to say thanks for all the nice comments on my last entry. I really appreciate it.